ONE AT A TIME. ONE OF A KIND. For over 91 years, this has been the philosophy behind Huckins yachts and the one-of-a-kind people who buy them. Since Frank Pembroke Huckins produced one of the world's first planing hulls in 1928, our company has held fast to his vision — creating yachts that are not simply uncommon, but positively unique. You can see it in every Huckins on the water today. The world-class design and craftsmanship. The innumerable opportunities for individual expression. The classic lines, belying a level of performance attainable only with ultra-modern materials and engineering. This is what goes into our yachts. This is what should go into yours. Navigate to our Contact page and let's get your one-of-a-kind vision cranked up. When you see one of our yachts on the water, heads will invariably turn and jaws inevitably drop. The classic beauty instantly announces itself as a Huckins, and in that sense nothing has changed since 1928. But over the course of an equally evolutionary and revolutionary company history, certain things have changed, and for the better. In 1975, Huckins unveiled a radical transformation from traditional cold-molded mahogany to fiberglass composite core construction (initially AIREX® and today Corecell™). Largely inspired by growing demand, the transition also presented a number of engineering advantages: significant weight reduction, for instance, allowing for a higher horsepower-to-weight ratio. That means more speed and fuel-efficiency on top of the exceptional strength and seaworthiness these space-age materials provide. Today, Huckins yachts are among the lightest, strongest and fuel-stingiest afloat, displacing thousands of pounds less than similarly-built competitive boats. Coupled with our legendary Quadraconic® hull, this weight-conscious design produces the Huckins-signature performance so admired by experienced yachters. Back in 1928, when Frank Pembroke Huckins launched his first yacht and the company that bears his name, the process of creating something extraordinary was a labor of love. 91 years later, we can assure you that the emotion runs in the family. 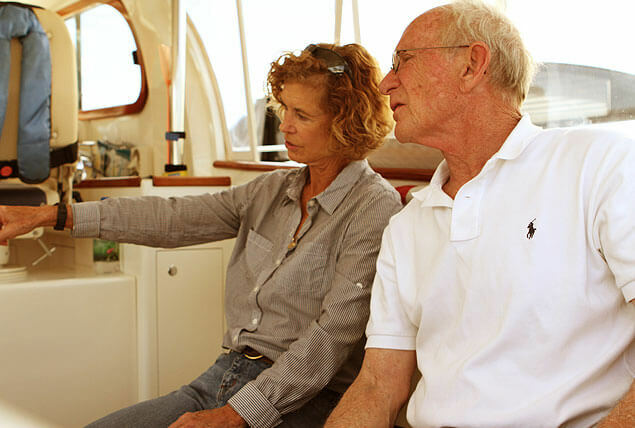 Huckins owner Cindy Purcell (granddaughter of Frank Huckins) and husband Buddy Purcell share the founder's vision and operate one of the oldest family-owned boat builders in the United States. Both began employment at Huckins in 1970 — Cindy in the stock room and Buddy starting off as a painter. Working hard and immersing themselves in Huckins philosophy and tradition, each was instilled with generations of know-how. The guidance of Kenneth Archibald, Cindy's father and then-president of Huckins, and George Pillsbury, vice-president and manager at the time, would later prove invaluable as Cindy and Buddy transitioned Huckins into the ultra-modern era of lightweight, fuel-efficient materials without sacrificing one ounce of our legendary elegance. 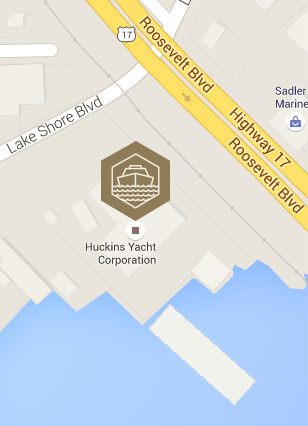 Today the couple oversee all facets of the manufacturing process and are proud to say that Huckins remains an extended family of employees and yacht owners.